The two reasons given for invading Iraq in 2003 were baseless: Saddam Hussein’s WMDs were illusory, as were his connections to al Qaeda. While this needless war is often attributed to an intelligence failure, we all are at fault. Our elected officials failed to ask the questions they should have before going to war. So did our media. And so did we, the citizens who hold the ultimate power of the ballot box. The drumbeat to war hypnotized the nation, overcame rationality, and led to disaster. My participation in that presentation at the UN constitutes the lowest point in my professional life. I participated in a hoax on the American people, the international community and the United Nations Security Council. How do you think that makes me feel? Thirty-one years in the United States Army and I more or less end my career with that kind of a blot on my record? That’s not a very comforting thing. The moment al Libi was water-boarded, he started blurting things out. Well, rather than questioning what he was saying and going into it in detail to see if what he was saying could be corroborated, they immediately stopped and ran off to report what al Libi had said – and ended the torture. And, bang, it gets up to the highest decision-makers. But, as often happens with information obtained by torture, al Libi was telling his captors whatever he thought they wanted to hear, in order to stop the torture. And a connection between Saddam Hussein and al Qaeda is what the Bush administration wanted to hear as can be seen from the events related below. Hit Saddam Hussein at the same time – not only Osama bin Laden … go massive. Sweep it all up, things related and not. Those words, including the underlining, were in notes taken by Stephen Cambone, then the Director for Program Analysis and Evaluation within the Office of the Secretary of Defense, at a meeting with Rumsfeld. 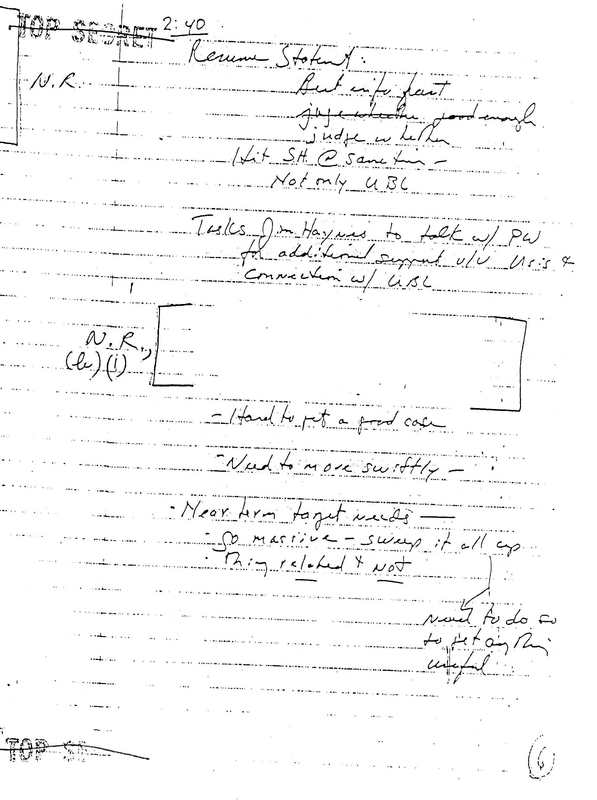 While they’re hard to read, I’ve attached a complete copy of Cambone’s redacted notes so you can see where those words came from. My excerpt above starts on line 5, “S.H.” stands for Saddam Hussein, and “UBL” for Osama (Usama) bin Laden. In his prime-time press conference last week, which focused almost solely on Iraq, President Bush mentioned Sept. 11 eight times. He referred to Saddam Hussein many more times than that, often in the same breath with Sept. 11. Just prior to his invasion of Iraq, President Bush formally linked Saddam Hussein with 9/11 when he confirmed to Congress that attacking Iraq was consistent with “continuing to take the necessary actions against international terrorists and terrorist organizations, including those nations, organizations, or persons who planned, authorized, committed, or aided the terrorist attacks that occurred on September 11, 2001.” That wording comes from the Authorization for Use of Military Force Against Iraq Resolution of 2002. Nothing. … nobody has suggested in this administration that Saddam Hussein ordered the attack. … the lesson of September 11th is take threats before they fully materialize, Ken. Nobody’s ever suggested that the attacks of September the 11th were ordered by Iraq. You could have the supporters of the President alone [on my TV show]. And they would say why this war is important. [But] You couldn’t have a dissenter alone. Our producers were instructed to feature two conservatives for every liberal. Anyone who hurts this country in a time like this. Well let’s just say you will be spotlighted. … I will call those who publicly criticize their country in a time of military crisis, which this is, bad Americans. [The] Washington Post gave that speech one sentence. 36 words. I calculated in 2002, the Washington Post probably published 1,000 articles and columns about Iraq. Probably one million words, in excess of one million words. And one of the most famous democrats in the country raised questions about the war, the Washington Post set aside 36 words. In the 10 years since the Iraq war, Putin’s worldview has only strengthened and expanded. Now he believes that the strong not only do what they want, but also fail to understand what they do. … Everything that’s happened since — including flirting with Islamists during the Arab Spring, U.S. policies in Libya and its current policies in Syria — serve as evidence of strategic insanity that has taken over the last remaining superpower. … Moscow is certain that if continued crushing of secular authoritarian regimes is allowed because America and the West support “democracy,” it will lead to such destabilization that will overwhelm all, including Russia. David Frum, The Right Man: The Surprise Presidency of George W. Bush, Random House, New York, 2003, pages 224 and 233. The post Avoiding Needless Wars, Part 9: Iraq appears on ScienceWonk, FAS’s blog for opinions from guest experts and leaders.